It is just before sunrise at Kalanki bus station and the gateway to 59 of Nepal’s 75 districts is already buzzing with activity. Night buses crammed with passengers have just started arriving in Kathmandu. They are the lucky ones. Cargo trucks are preparing to head back to the Tarai, some of them will not make it to their destination in one piece. 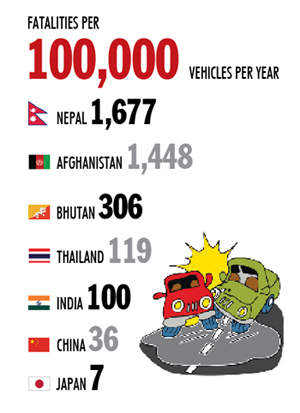 Nepal’s highways are one of the most dangerous in the world and the chances of a bus, truck or car having a crash are more than 100 times higher than in Japan and 10 times higher than even India (see chart). Because of Nepal’s topography, poor road conditions, careless drivers, and lack of regulation, the chance of passengers surviving an accident is also much lower here than anywhere else. One person died in every five accidents in Nepal in the last year, whereas the figure for Japan is one death in every 150. 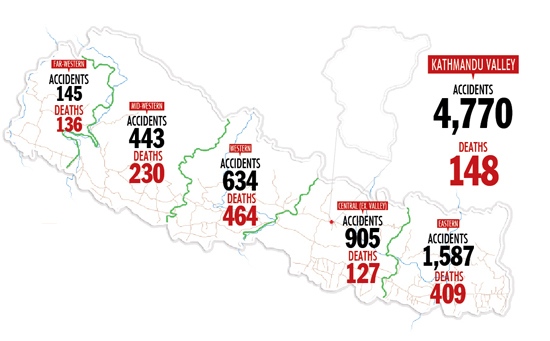 Nepal’s fatality rate per accident goes higher as one travels westwards, with nine deaths for every 10 accidents in the far-west. 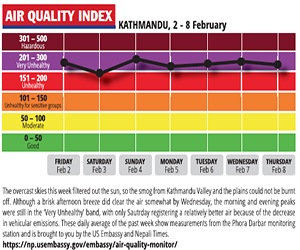 Kathmandu has seen a dramatic decline in traffic fatalities, with only one death for every 33 accidents. More people have died on Nepal’s highways in the past decade than in the 10 year conflict. Nearly 10,000 people have died on the highways since the war ended in 2006, with the total annual fatalities doubling in that time. 15 July 2013: Bus from Baitadi went off the road in Dhading. 3 killed. Driver had been at the wheel for 14 hours straight, had been speeding, and may have fallen asleep. 6 July 2013: Bus fell off the Madi Bridge in Tanahu. 11 killed. Witnesses said the driver swerved to save children crossing the bridge. 12 January 2013: A bus veered off the Bhim Datta Highway in Doti at 3 AM and fell 700 metres into the valley below. 33 killed. The speeding bus skidded on ice. 13 October 2011: Bus fell into the Sun Kosi River on Khurkot-Nepalthok section of under construction section of BP Highway. 44 killed. Over-crowded bus should not have been plying on dangerous, incomplete mountain road. 3 May 2011: Bus fell off the Khurkot-Nepalthok section of the BP Highway. 11 killed. Driver negligence. Police know what causes most of these accidents: dangerous, poorly-maintained, slippery, and narrow mountain roads, landslides, over-crowded buses, carelessness, and drunkenness of drivers. 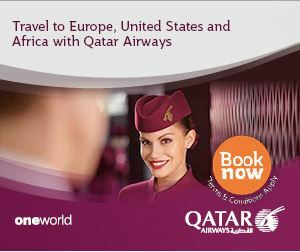 However, they seem powerless to control overloading and reckless driving. Even if police investigations find drivers guilty, powerful transport syndicates with political protection set them free. “The government has tried to retire vehicles more than 20 years old, but it hasn’t been able to enforce it for years,” says Pawan Kumar Giri, spokesperson for the Traffic Police. But ultimately it is careless driving on treacherous roads that is the main cause of Nepal’s high highway fatality rate. One success has been the anti-drink-and-drive campaign in Kathmandu and other urban centres. However, because of the lack of police manpower not all the roads in the country can be covered. Giri says the number of accidents and fatalities will keep on increasing if the government doesn’t bring stronger laws to show it is serious about preventing accidents.